" Entry to the towers is 7,000 VND, and within a short climb you have one of the best views of the surrounding countryside you�re likely to have in Viet Nam. The towers (there are 3 remaining) have been extensively restored however they remain just as impressive as they would have been 900 years ago. 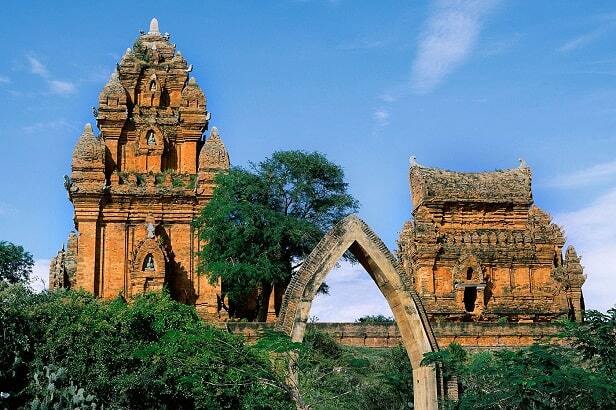 There are numerous other sites such as this (including one right in the middle of Quy Nhon itself), with Binh Dinh province having the richest collection of remaining Cham architecture in Viet Nam. There is little information available in English at the site however this doesn�t detract from the impression they make and the wonderful view afforded." The Banh It Towers - are located about 20 kilometers from Quy Nhon, halfway between the airport and the city. The Banh It Towers are included in the book "1001 buildings you must see before you die", written by a group of British writers. Incidentally, this is the only architectural monument in Vietnam, which is included in the book. The Banh It is a very picturesque complex on a prominent hill between two branches of the river "Con". This river flows from the citadel of the royal city of Cham (now gone) to the bay of Qui Nhon. The towers have had quite a bit of restoration work, but original carvings still adorn the walls. 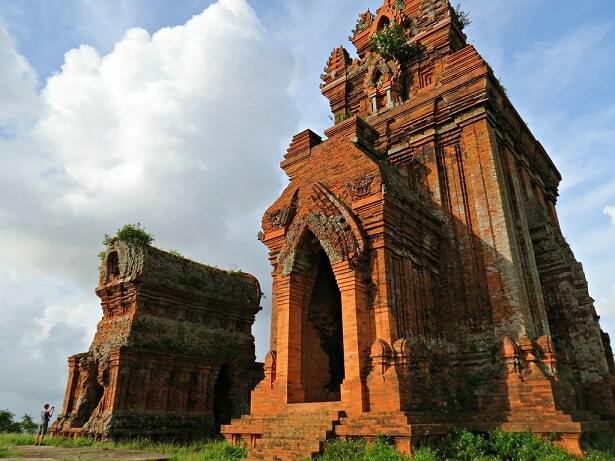 The Qui Nhon Banh It Towers is a group of four towers, known as the Silver Towers. They are one of the best preserved examples of late Cham architecture. The Cham kingdom ruled over southern and central Vietnam from the second century and reached the height of its power in the ninth century. The Cham were adopted Hinduism and they made it a state religion. They copied the architecture to Indian model to create something unique in Vietnam. This is best illustrated by Kalan. The term Kalan refers to one of the main towers, which is centered in this field. This is one of the most important objects, when they going to worship their god. In this case it's a statue of the Hindu god Shiva. In the 10th century the power of the Cham began to diminish and the late Cham architecture declined. They wanted no more of the early Cham architecture. Early Cham art focused on simple motifs. It lacked in sophistication, but they made beautiful monuments. The refinement you will find the Banh It Towers or Silver Towers. They built the towers up on the hill. First, the smaller towers and then the main tower: the most important temple. This the one with the statue of Shiva. The complex is constructed as a sort of pyramid. 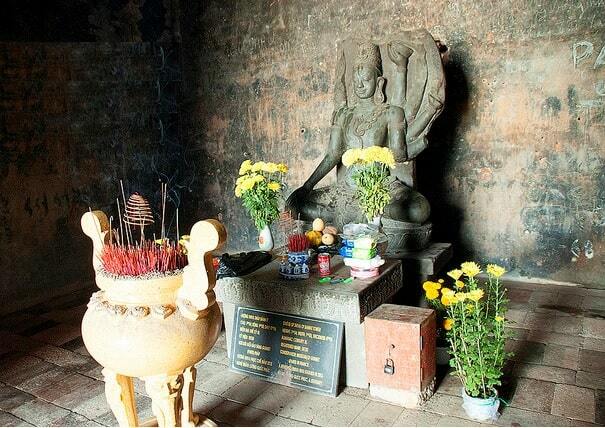 Constant wars with the Khmers also demanded their toll. Some towers were destroyed. Fortunately, some were already renovated. Among the silence, tourists can just about hear the twitters of birds and bats nesting in the main tower. To get to the towers, tourists need to conquer a small sloping road paved with bricks and lined by tree shapes. On the peak at a few dozen meters above sea level, not only can you sense the boundless of heaven but also can take a panoramic view of scattered houses, green farms in the villages and winding rivers and streams below.